Brass Victorian cupboard knob with loose back rose. Available in 25mm, 32mm 38mm & 45mm diameter sizes. •Knob: Diameter 25mm. Rose: Diameter 30mm. Projection: 27mm. 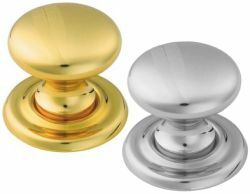 •Knob: Diameter 32mm. Rose: Diameter 37mm. Projection: 31mm. •Knob: Diameter 38mm. Rose: Diameter 42mm. Projection: 36mm. •Knob: Diameter 45mm. Rose: Diameter 47mm. Projection: 42mm.